Thus, if the lower of cost and market rule is applied to individual items, the cost would be $550,000. If the lower of cost and market rule is applied to categories, then the cost will be $563,000 and if the lower of cost and market rule is applied to total inventory, then the final inventory would be $563,000. Notice in all these cases we are comparing the categories with Net Realizable Value column. 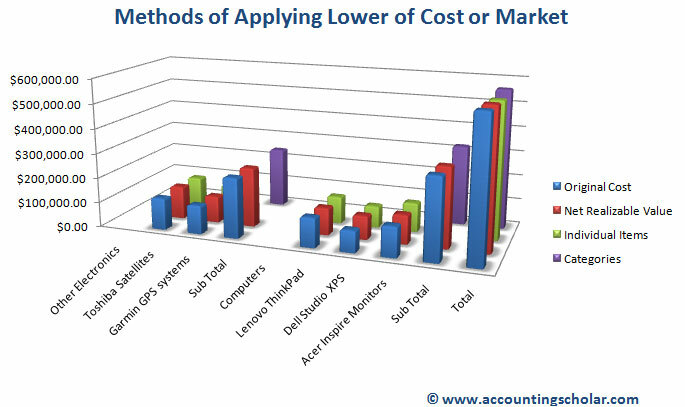 This graph above shows a break down of the inventory costs of Other Electronics & Computers sub-categories & their totals with a break down of the Original Cost, Net Realizable Value, Individual Items & by Categories.